Users in different VPNs cannot access each other. A BGP/MPLS IP VPN uses the Border Gateway Protocol (BGP) to advertise VPN routes and the Multiprotocol Label Switching (MPLS) to forward VPN packets on backbone networks. To exchange routes between a PE and a CE, static route, RIP multi-instance, OSPF multi-instance, ISIS multi-instance, or EBGP, can be used. A Customer Edge (CE) is an edge device on the customer network, which has one or more interfaces directly connected to the service provider network. Usually, CEs do not know anything about VPNs and do not need to support MPLS. A Provider Edge (PE) is an edge device on the provider network, which is directly connected to the CE. In the MPLS network, PE performs all the VPN-related processing. A Provider (P) is a backbone device on the provider network, which is not directly connected to the CE. P router only needs to possess basic MPLS forwarding capabilities and does not need to maintain information about VPNs. To simplify our topology, only 2 PE routers have been used, P router is not necessary to show VPNs functionalities. Configure basic MPLS capabilities and MPLS LDP on the MPLS backbone network to set up the LDP LSP. TOTAL: 3 Normal LSP(s) Found. TOTAL: 1 Liberal LSP(s) Found. TOTAL: 0 Frr LSP(s) Found. Establish the MP-IBGP peer relationship between the PEs. Configuration of PE4 is similar and it is omitted here. Route distinguisher RD is used to distinguish the IPv4 prefixes with the same address space. Address spaces of different VPNs may overlap. The VPN target is a 32-bit BGP extension community attribute. BGP/MPLS IP VPN uses the VPN target to control the advertisement of VPN routing information. Export target: After learning the IPv4 routes from directly connected sites, a local PE converts the routes to VPN-IPv4 routes and sets the export target attribute for those routes. 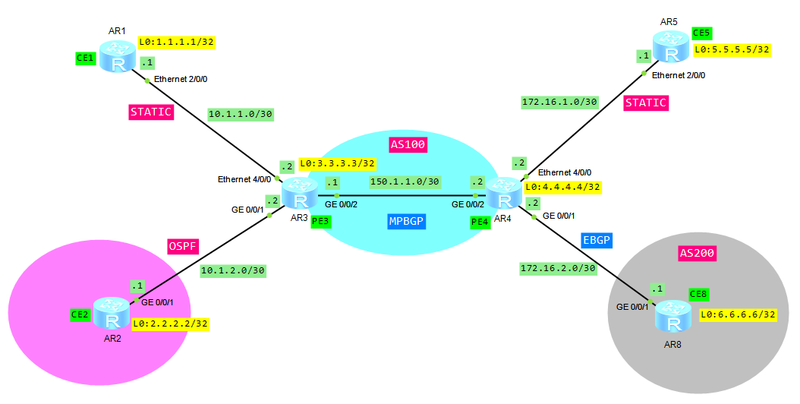 As the BGP extension community attribute, the export target attribute is advertised with the routes. Import target: After receiving VPN-IPv4 routes from other PEs, a PE checks the export target attribute of the routes. If the export target is identical with the import target of a VPN instance on the PE, the PE adds the route to the VPN routing table. Info: All IPv4 related configurations on this interface are removed! Info: All IPv6 related configurations on this interface are removed! As we can see, users in different VPNs cannot access each other.